Fulfilling Dreams since 2003! 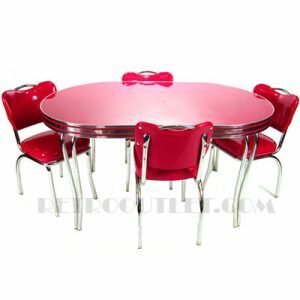 Retro Outlet is the home of the highest quality USA made retro furniture. Our products have withstood the test of time and hold up beautifully for years of satisfaction. Whether you need to outfit your home, diner, restaurant, showroom or simply want to give your kitchen a make-over, you have come to the right place! We hope you enjoy your shopping experience and we are here for you should you have any questions. Our Customer service is second to none! Order first class, custom built retro furniture at outlet pricing from Retro Outlet. Our business model is simple: offer expert consultation before the point of sale, and deliver premium quality American-built furniture at a price point our competitors cannot match. We never hide fees or nickel and dime customers with unexpected charges. Our pricing, including shipping discounts, which we pass directly on to you. For large projects like outfitting an entire room or setting up a restaurant dining area, our experts will help you design the perfect arrangement within your budget. We have over 20 years of experience in planning and implementing big projects. Our knowledgeable consultants at BARSandBOOTHS.com, the parent company of Retro Outlet, are experts at working with restaurants, commercial businesses, or other large residential projects. They have helped customers in 40 countries and every state in the Union make informed furniture choices. They will help you save money by, 1) avoiding making costly mistakes, and 2) packaging all your items together to lower the shipping costs. To speak with a professional who specializes in larger projects, visit www.barsandbooths.com or call 304-728-0547.